Yo! Was busy with the bazaar.. it is finally over!!!! My photographer went awol but there is a photoshoot planned tomorrow/wednesday, so makeup tutorials coming back soon yea.. STEP 1 : DOWNLOAD THE SECRET WEAPON! Adjust the contrast and brightness of the photo to make yourself fairer! Take away all your face’s defects. No doctor required. Once again, click on the link if you have forgotten how to do it. STEP 4 : SMOOTH YOUR SKIN! Give your skin a baby glow! Remember how to do it? If not, click! STEP 5 : DARKEN THE SHADOWS! 1. Click on the tool in number 1, hold your mouse button. 2. Choose the Burn tool. 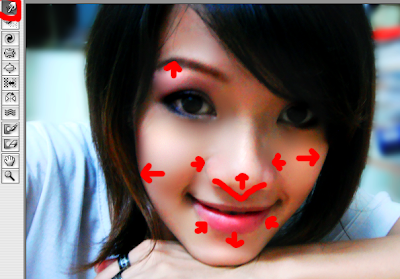 Paint on the red areas, darkening your brows, eyes and mouth gap areas effectively. STEP 6 : HIGHLIGHT THE WHITES! 4. 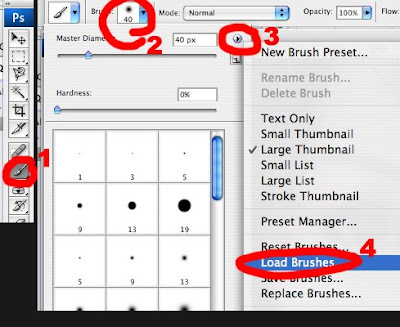 Change the brush size by clicking [ or ] ..Keep this in mind k.. 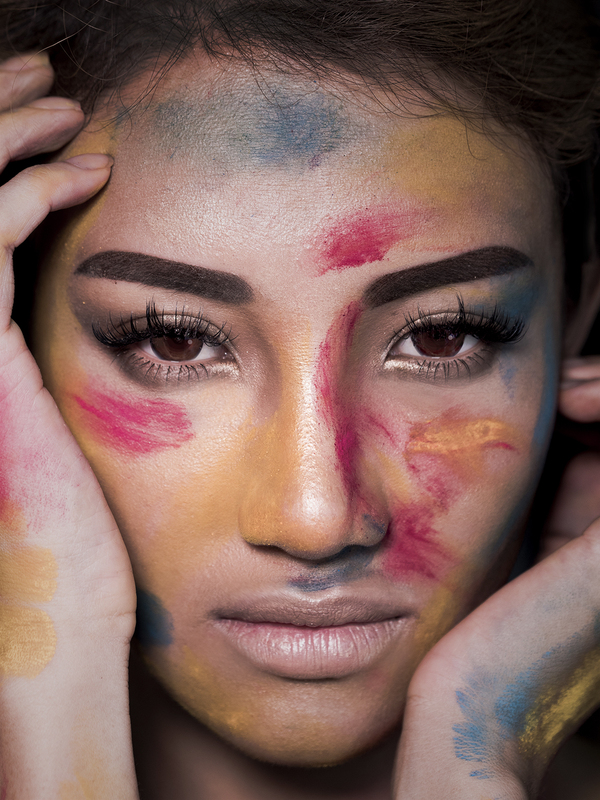 Paint over the cheeks, nose bridge and your brow bones. 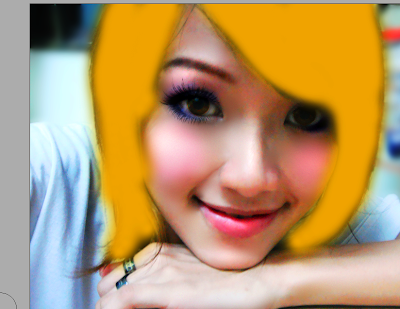 There you go, virtual sculpting and contouring using Burn and Dodge tool! Now your face won’t look so flat! 3. Push all the areas in the direction showed. Aim for stronger jawline, V shaped and smaller nose, defined lips, higher cheekbones and higher brows! Imagine you can plastic surgery yourself and go crazy! Smaller nose, cuter lips and more defined bone structure. Oh, and bigger Japanese eyes! 1. Click on the Brush tool, remember this tool! 7. You will be able to see all your new brushes in your brush type list now! 2. Choose the contacts you like.. I chose the one shown. 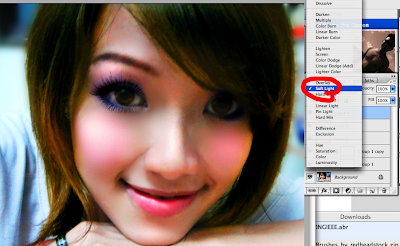 5.Click on the color swatch, change it to the color you want your contacts to be. 6. Adjust the size using [ and ] to fit your irises. 7. Click once! Look at the result at the picture above this one labeled 5. 1. 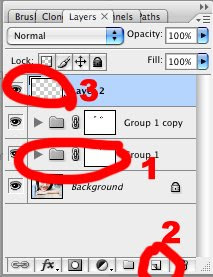 Change the blending mode to Color Dodge so that your contacts lighten your iris, use Multiply if you wanna darken your irises. 2. Result shown with arrow. Do this as many times and you think is neccesary. 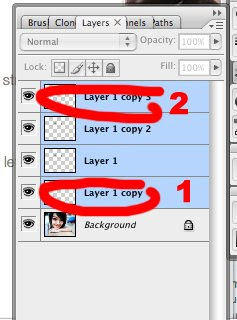 For each layer, play with the blending modes until you get the effect that you are looking for, you can drag the layers below or on top of one another. 1. At the end of your playtime, click on the lowest contacts layer. Hold shift and click the one right on top. This selects ALL your contact layers. Hit CTRL G to group them. 3. 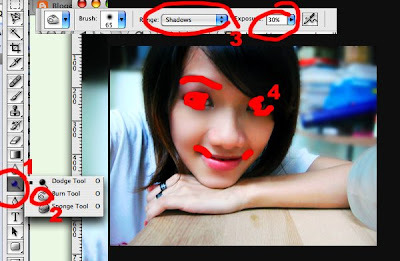 Get your brush tool and click on the one above. Change the color to black. When you try to paint over your contacts, you will notice that black act as an eraser and white act as the opposite. Paint over all the contacts area that flood out of your irises area, for example your eyelids and such so that the contacts only apply to your irises and nowhere else. 2. Hit New Layer icon. 3. Select your newest layer by clicking on them! 2. Choose your fave pair of lashes. 3. Adjust the size accordingly using [ and ], pick a colour you like. 4. 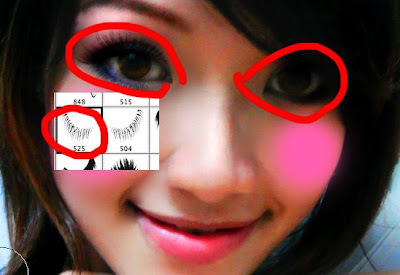 Click on your lashes. 6. Click on the photo to get your new lashes! If the colour is too intense, turn the opacity down until you feel comfortable with the result! 5. Click on the colour that you want. 2. Adjust the size until it fits your cheek. 2. Play with the opacity until you fade it to your desired tone. 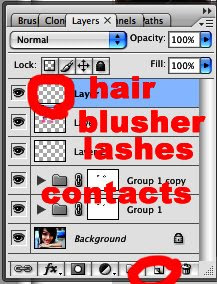 So now you have your contacts layers, lashes layer and blusher layer. We are gonna add one more, so make another new layer. By now you should be familiar with the brush and color picking..
2. Pick the colour you want your hair to be. 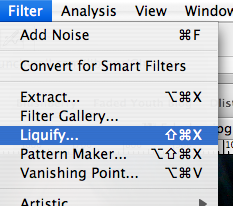 Set the layer’s blending mode to Soft Light. 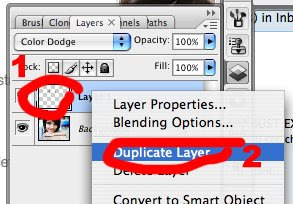 If you feel that it isn’t doing anything, duplicate the layer. Too much? 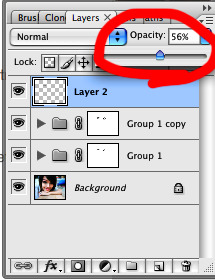 Turn the opacity down. 🙁 secret weapon file needs isn’t working… can you upload again? This is such an amazing tutorial!!! !